Annapolis, MD — Poorly trained abortion facility staff. Unsterilized surgical instruments. Unsanitary facility conditions. Patient injuries and deaths. Abortion clinic administrators who appear to have no idea how to operate a medical facility. These startling violations are not referring to Kermit Gosnell’s now-defunct Philadelphia “House of Horrors” abortion mill, as one might expect. Instead, these violations were found at licensed surgical abortion facilities in Maryland – some repeatedly with no guarantee that all affecting patient safety have yet been corrected. A round of re-licensing inspection reports were recently released by the Maryland Department of Health and Mental Hygiene’s Office of Health Care Quality (OHCQ). They paint a disturbing picture of substandard conditions and shoddy practices that characterize abortion facilities in that state. Currently, there are 16 surgical abortion facilities operating in Maryland. 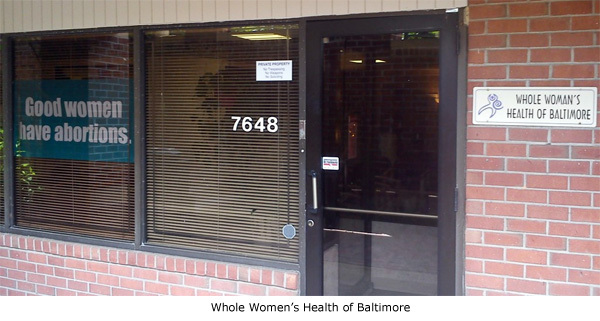 Two facilities, Gynemed Surgical Center in Baltimore and Femi-care Surgery Center in Owings Mills, are licensed as “Ambulatory Surgical Centers” instead of “Surgical Abortion Facilities.” Because of this, these facilities are not listed on the Surgical Abortion Facility roster. •	An inspection report from Gynemed Surgical Center in 2009 showed multiple deficiencies. •	No inspection report for Femi-care Surgery Center is available at the DHMH website. Operation Rescue has confirmed that two additional facilities are illegally conducting surgical abortions without any facility license whatsoever, as required by law. These facilities have been reported to the Office of Health Care Quality, which has not acted to shut them down. 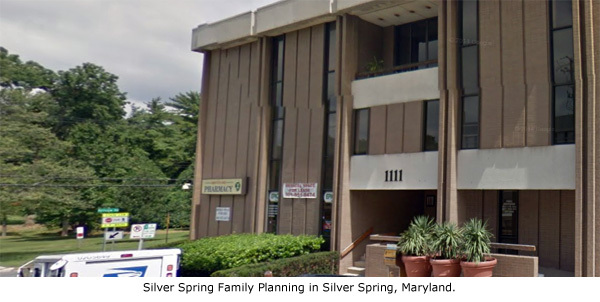 •	Women’s Health Center in Bethesda, operated by previously disciplined abortionist Alan J. Ross. The twelve remaining abortion businesses are licensed as Surgical Abortion Facilities and are regulated as such. All twelve have been cited for failing to meet the regulatory requirements for surgical abortion facility licensing. The re-licensure and complaint-related inspection reports for Surgical Abortion Facilities reveal not only appalling practices at Maryland’s abortion facilities, but also raise major issues with how the OHCQ is handling abortion facility violations and how complaints are being treated. When Maryland first implemented its abortion facility license requirements in 2013, it conducted initial licensing surveys of each abortion business that offered surgical abortion services. All twelve abortion facilities were cited for deficiencies and ordered to submit a Plan of Correction (POC) within ten days. However, no follow-up inspections were ever made after the initial round of inspections to ensure that health and safety violations were in fact corrected. Two years later, re-licensure inspections were conducted. Those 2015 inspection reports show that some facilities were cited for the same deficiencies that were previously cited during the initial 2013 licensure inspections. In many cases, dangerous practices that existed at the time the facility was initially inspected were never corrected. Those conditions continued to exist over the next two years, placing women at risk. In other cases, deficiencies were cited in 2015 that obviously existed during the 2013 licensing inspections, but were ignored overlooked during the initial licensing inspection. That means those abortion facilities were never in compliance with licensing requirements and therefore did not qualify for licensure. They were improperly licensed as Surgical Abortion Facilities by the Office of Health Care Quality! 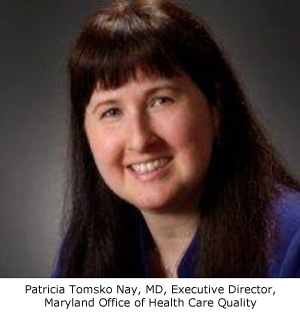 The Executive Director of the Office of Health Care Quality is Patricia Tomsko Nay, MD. She previously served as the Medical Director for the OHCQ. In January, 2013, Nay was appointed as Acting Executive Director of the OHCQ. That appointment was made permanent eight months later. It was Nay who was at the helm of the OHCQ when the initial Surgical Abortion Facility licenses were issued, and she continues to oversee the department. Her name is found on several letters to abortion facilities regarding correction plans, indicating she takes a hands-on approach to oversight. Inspection Reports for two affiliated abortion facilities, Metropolitan Family Planning in Suitland and Berwyn Heights, showed particular cause for concern. Both are owned by Abolghassem M. Gohari, an abortionist who faced disciplinary action in Maryland in 2012, including a reprimand and fines, for failing to use qualified staff and for patient abuse. The Medical Board of California forced Gohari to surrender his medical license in that state, noting particularly Gohari’s documented abuse of patients. •	Failure to maintain the abortionist’s credentials or check his license with the National Practitioners Data Bank to ensure he/she was in compliance with NPDB criteria, as required. •	Failure to record a discharge diagnosis for all patient charts reviewed. o	Expired surgical supplies – some of which had expired as long ago as 2006.
o	Failure to use enzymatic cleaners on surgical instruments prior to sterilization. o	Failure to conduct weekly spore testing on the autoclave to ensure it is sterilizing properly. No follow-up inspection took place to verify the deficiencies had actually been corrected to bring the facility into regulatory compliance. Nevertheless, the OHCQ issued a Surgical Abortion Facility license. •	Staff members were poorly trained and failed to demonstrate competency in patient care and infection control. There was no evidence the workers had ever received infection control training. Proper infection control practices appeared to be non-existent. •	Policies that were supposed to be maintained by the facility and reviewed yearly were found to be missing important components. Some were “boiler-plate” policies that seemed to be cut-and-pasted from somewhere, perhaps from the Internet, and were non-specific to Maryland requirements. Quality control was non-existent. This condition had to exist in 2013, but was never cited during the initial licensing inspection. •	There was no testing to ensure the staff was free from communicable diseases like Hepatitis B and C or Tuberculosis. •	The facility failed to maintain emergency plans or conduct fire and disaster drills. •	There was a failure to conduct preventative maintenance and/or testing for equipment, including fire extinguishers, ultrasound machines, and autoclaves (a repeat offense). •	The facility failed to obtain abortionists’ licensing credential or check them with the National Practitioners Data base. This same violation was cited in 2013, but never corrected. •	Staff lacked Advanced Life Support or Basic Life Support credentials as required. •	The facility had no automated external defibrillator, no way to monitor oxygen levels, and no suction machine for clearing patient airways in the event of an emergency. Perhaps worse, the clinic administrator indicated he/she was not aware this critically important equipment was needed. This condition obviously existed in 2013, but was not cited prior to issuing a Surgical Abortion Facility license. •	Staff members were not trained for emergency patient transfers to the hospital. •	Expired medications were found, including a genital wart treatment that expired in 1987. Other medications were 1-15 years out of date. These violations obviously existed in 2013, but were not cited during that inspection. o	Examination tables were dirty and stained. Upholstery was cracked or ripped and repaired with tape, making the surface impossible to disinfect. o	Household cleaners were used for instrument cleaning instead of medically approved enzymatic cleaners (another previously cited violation that was never corrected). o	Supplies were expired (a previous citation) or covered with “rust” stains. It is clear that the inadequate policies, lack of important patient care/safety equipment, poor training and other violations were conditions that existed at the facility for a very long time. When questioned about the conditions, the clinic administrator repeatedly indicated that she was either unaware of the problem or unaware of the basic minimum requirements her facility violated on a daily basis. The administrator was given ten days to submit a plan of correction, but records show that the plan was received until five months later. Despite this, the clinic’s Surgical Abortion Facility license was renewed. “It’s maddening to read of the incompetence of the clinic administrator, who was endangering the lives and health of women. It’s unbelievable that the Department of Health could allow this abortion facility to continue to operate under her direction,” said Newman. Things were not much better at Gohari’s second Metropolitan Family Planning facility in Berwyn Heights. •	Failure to ensure infection control and provide a sanitary environment. A lack of handwashing was particularly cited. •	Failure to document credentials of abortionists or check them with the National Practitioner Data Bank to ensure compliance with NPDB criteria. There was nothing to stop an unqualified individual from conducting abortions there. •	Failure to note a discharge diagnosis. In fact, no discharge diagnosis was ever done. •	Failure to ensure confidentiality of medical records. The records room was left unlocked and unsupervised. Anyone who visited the facility had at least the opportunity to rifle through the records without staff knowing. •	Failure to adequately sanitize surgical instruments. Household cleaners were used that did not adequately destroy contaminates and the autoclave was not maintained or tested to ensure proper sterilization. The facility was ordered to submit a plan of correction, but without a follow-up review to document that the plan of correction was in fact implemented, there was no way to confirm that the facility was in compliance with licensing requirements. Nevertheless, the OHCQ issued Metropolitan Family Planning of Berwyn Heights a Surgical Abortion Facility license, which allowed it to conduct surgical abortions. Two years and nine months later, the OHCQ returned to the Berwyn Heights facility to conduct a re-licensing survey. What they found there revealed not only continued shoddy practices on the part of the abortion business, but disturbing faults in the Department’s inspection and licensing process for abortion facilities. In October, 2015, an OHCQ inspector found numerous deficiencies, including the same insufficient process of surgical instrument sanitation that was cited nearly three years previously. Because the OHCQ failed to follow up to make sure the 2013 deficiencies were corrected, it left women vulnerable to infections and diseases transmitted through the use of unsanitary instruments. •	Failure to train employees in infection control. Employees lacked competency in patient care as well as infection control. •	Missing policies and procedures similar to those found at the Suitland location. These apparently were also missing during the 2013 survey, but were not cited by inspectors. •	Failure to ensure employees were tested for and free from communicable diseases, including Tuberculosis and Hepatitis B and C.
•	Failure to maintain fire/disaster plans and conduct drills. There was no evacuation plan. •	There was no training for patient transfers to the hospital. •	Failure to ensure employees maintained required Advanced and Basic Life Support certification. •	No suction machine to clear airways in the event of an emergency. •	Inadequate autoclave testing to ensure surgical instruments were properly sanitized. This was also cited in the 2013 inspection. A plan of correction was submitted by the abortion facility, albeit two and a half months late. The plan was never implemented, and again, there is no record of any follow-up visit to ensure these violations were ever actually corrected, yet Metropolitan’s Surgical Abortion Facility license was renewed. The issues that existed at the Metropolitan Family Planning abortion facilities were not unique. 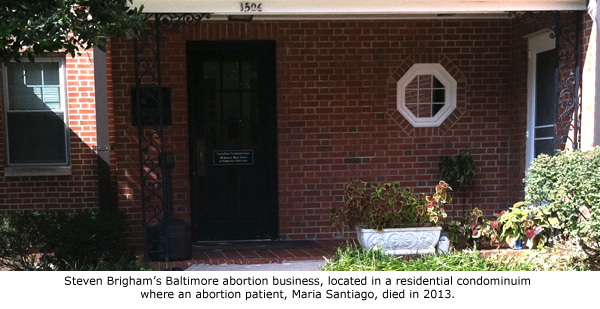 Similar violations were found at other abortion sites in Maryland. According to the DHMH’s web page listing of Surgical Abortion Facility inspection reports, Germantown Reproductive Health Services (GRHS) has been inspected eight times since 2013, including six inspections that were the result of complaints. This is the facility where the notorious abortionist LeRoy Carhart conducts late-term abortions throughout all nine months of pregnancy. An initial licensing inspection took place at GRHS on February 11-13, 2013, just days after the documented abortion-related death of Jennifer Morbelli. That inspection yielded six pages of deficiencies. Suspiciously, that report has been removed from the DHMH website and replaced with a duplicate of a complaint survey from the same date that shows no deficiencies were cited. Operation Rescue archived a copy of the actual initial licensing inspection report on AbortionDocs.org. •	The medical director (LeRoy Carhart) admitted that he and the nursing staff administer I.V. sedation medications to surgical abortion patients. However, there was no documentation to show the nurses were trained or competent to administer or monitor I.V. sedation. •	No documentation existed to show Carhart’s credentials were checked with the National Practitioner’s Data Bank as required to ensure compliance with NPDB criteria. •	GRHS employed a nurse involved in medication management whose nursing license had expired. •	Staff was untrained in emergency patient transfer protocols, (a dangerous violation in light of the ten patient medical emergencies that would soon follow). •	Staff improperly used multi-dose medication vials and failed to properly label drugs. •	Discharge diagnoses were missing from patient medical records. •	Improper sterilization of surgical instruments was observed. While a plan of correction was due within 10 days of being informed of the deficiencies, it was not until May 7, 2013 – nearly three months later – that the Office of Health Care Quality acknowledged that a plan of correction was received. A Surgical Abortion Facility license was granted even though there was no follow-up inspection to ensure violations were actually corrected to bring the facility into compliance with licensing requirements – something that should be the highest priority for a facility conducting risky late-term abortions. Despite ten documented medical emergencies since 2012, including an abortion-related patient death, several complaints, which included documentation of suspected violations, were routinely dismissed – with one exception. A complaint-related inspection took place on April 15-16, 2014. Yet on the OHCQ website, that inspection report was buried at the end of a file marked March 11, 2014, which contained the result of a complaint investigation that “cleared” GRHS with no violations cited. In that buried inspection report, there was a citation issued for a violation that affected patient care, which was unrelated to the complaint. GRHS had failed to ensure that all employees were competent to do their jobs. There was no documentation that Certified Medical Assistants were trained to inject medications into I.V. bags, such as the labor-stimulant Pitocin, which was a routine part of their duties. “The Failure of the facility staff to ensure that all staff are competent to do their jobs, placed the patients at risk of having care provided by untrained or unqualified individuals,” the report stated. The report notes that a plan of correction was not submitted within the required 10 days. Instead, it was not received until July 10, 2014 – almost three months late. There is no evidence that a follow-up inspection was conducted to ensure that the training was actually done. Another inspection report obtained by Operation Rescue, which has been mysteriously omitted from the OHCQ website listings, noted that on September 25, 2015, GRHS was cited for failing to maintain a current medical laboratory permit. The permit expired in August, 2013. The abortion facility was also cited for displaying an expired license. This unpublished report raises more questions about how the Office of Health Care Quality handles abortion clinic violations. Why was GRHS not cited for these failures during the five inspections that took place during the two years the facility was in violation? Why was the September 25, 2015, report that documented the violations omitted from the DHMH web site? As mentioned, Dr. Patricia Nay serves as Executive Director of the OHCQ and shoulders the ultimate responsibility. Barbara Fagan, who serves under Nay as Program Manager for Ambulatory Care, appears responsible for notifying abortion facilities of deficiencies and ensuring that acceptable corrective plans are submitted. These two women have much to answer for. During the most recent “inspection” of GRHS on May 20, 2016, which was brought on by a citizen complaint, Nay wrote a letter to GRHS confirming them to be in full compliance. However, the report indicated that this finding was made without an inspector ever visiting the abortion facility. The determination was made after a mere telephone conversation with the clinic administrator. From this, it appears that the Office of Health Care Quality is not taking complaints as seriously as it should. This is similar problem that existed in the Pennsylvania Department of Health, which turned a blind eye to complaints and therefore allowed Kermit Gosnell’s abortion facility to descend into chaos and squalor. The grand jury that indicted Gosnell issued a scathing 281-page report heavily criticizing authorities in that state for their lax attitude toward abortion facility complaints. They recommended that those responsible for the lack of enforcement should be fired. Gosnell was later convicted of hundreds of crimes related to illegal abortions, operating a corrupt organization, and the murder of babies born alive during failed late-term abortions. So far, Nay and Fagan have given Carhart and GRHS a free pass on violations, even when patient health is impacted by the substandard practices. •	Lack of procedures for dealing with safety issues, such as fires or mechanical hazards. •	Failure to train nine employees in patient transfer procedures. •	Improper labeling and storage of drugs. •	Failure to record discharge diagnosis in patient files. •	Failure to ensure proper sterilization of surgical instruments. Despite no follow-up survey to ensure compliance, the Hillcrest Clinic was issued a Surgical Abortion Facility license. A relicensing survey was conducted on May 20, 2015. Again conditions and practices at this facility appear to have deteriorated. Twenty-one pages of violations were discovered and cited, including re-citations for nearly all the violations that were found in 2013. A follow-up inspection was conducted in September 2015 – one of only three follow-up inspections conducted by the OHCQ since licensing was first required in 2013. Even more violations were uncovered. Despite the chronic deficiencies, the OHCQ took no action to fine or otherwise discipline the Hillcrest Clinic. Their licensing as a Surgical Abortion Facility was never impacted. The Hillcrest Clinic voluntarily closed in February 2016, for renovations as the result of a reported change in ownership. It was required to reapply for licensure in order to reopen as a surgical abortion facility. That month, pro-life activists documented the illegal dumping of private patient medical records – a Federal HIPAA violation – and the illegal dumping of two full cases of a controlled substance, Lidocaine, in a construction dumpster. Complaints were filed with the Office of Health Care Quality, to which OHCQ Executive Director Patricia Nay personally responded. She acknowledged in a letter that it had substantiated the violations, but could do nothing but refer them to other agencies since the facility was then unlicensed and outside their jurisdiction. When the Hillcrest Clinic reopened in early April 2016, it did so without a valid surgical abortion facility license. However, a licensing inspection conducted on April 12, 2016, remarkably found the Hillcrest Clinic in full compliance. The facility continued to operate without a valid Surgical Abortion Facility license – with the full knowledge of the Office of Health Care Quality – until one was finally issued in sometime in May. •	There was no documentation that the National Practitioner Data Bank was checked to ensure the abortionist(s) complied with NPDB criteria. •	In all five patient files examined, none contained discharge diagnoses as required. Even though no follow-up inspection was done to ensure the citations were actually corrected, Planned Parenthood was issued a Surgical Facility License. •	Staff failed to demonstrate they were competent to do their jobs upon hire. •	Several staff had no documented certification in Basic Life Support, or had expired certification on file. •	Staff was not trained in patient emergency transfer protocols. •	Improper cleaning and sloppy sterilization techniques were observed that compromised infection control and patient safety. Planned Parenthood was instructed to submit a plan of correction within ten days. “Failure to submit an acceptable plan of correction may result in revocation of license from the Surgical Abortion Facilities program,” warned a note at the end of the deficiency report. However, no plan was submitted within the time-frame. Documents indicate that a letter was send on December 4, 2015, reminding Planned Parenthood of the deficiencies and the need for a plan of correction. There was no response. Finally, on February 8, 2016 – a full six months after Planned Parenthood was notified of the August 4, 2015, deficiencies – another letter was sent to the abortion business by Ambulatory Care Programs Manager Barbara Fagan, reminding them to return a plan of correction. This time, there was no mention of license revocation as there was in the inspection report. “Please be advised that if we have not received the POC by February 15, 2016, an on-site inspection will be conducted to ensure compliance with regulatory requirements,” Fagan wrote. Planned Parenthood finally submitted a POC on February 8, 2016. However, there is no record that any follow-up visit was conducted to ensure the facility was actually in compliance with licensing requirements. There is also no evidence Planned Parenthood suffered any consequences for failing to meet licensing prerequisites or for being six months late with a correction plan. Instead, its Surgical Abortion Facility license was renewed without interruption. •	Failure to maintain the autoclave. It was leaking water onto a shelf below the machine. •	Failure properly sterilize surgical instruments. There was no documentation that spore testing was ever done on the autoclave, which must be done weekly to ensure sterilization is taking place. While the OHCQ’S Patricia Nay issued a letter informing Planned Parenthood that a follow-up inspection may be forthcoming, no such inspection was ever made to ensure corrections were ever made. A Surgical Abortion Facility license was issued anyway. The Planned Parenthood facility was re-inspected on July 28, 2015. In an extremely rare event, the inspection report showed the facility was in compliance. Its Surgical Abortion Facility license was renewed. 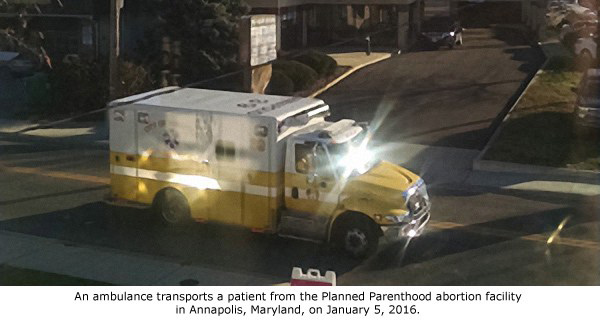 But on January 5, 2016, a patient was transported by ambulance from that Planned Parenthood abortion facility to a local hospital. While information in the Computer Aided Dispatch record indicated that the emergency did not appear to be life-threatening, it still proved that the facility is not equipped to handle even non-critical emergencies, despite supposedly meeting the state’s licensing requirements. A visit to the DHMH’s website shows that neither the initial 2013 licensing inspection report nor the relicensing inspection report from 2015 for the Baltimore Health Center Planned Parenthood are accessible to the public as of this writing. However, Operation Rescue previously obtained a copy of the Baltimore Planned Parenthood facility’s initial survey. It notes that the first inspection was conducted on February 15, 2013, when several deficiencies were cited. •	Failure to ensure that staff is competent to do their jobs. One worker showed no evidence she was ever trained or competent to administer or monitor IV sedation. •	Failure to ensure all staff were trained on emergency patient transfers to the hospital. •	Failure to ensure all staff were certified in Basic Life Support. •	Failure to record a discharge diagnosis in medical records. This omission was found on all medical records examined. No follow-up inspection took place to ensure continual compliance before a Surgical Abortion Facility license was issued. Efforts to obtain the 2015 re-licensing report have thus far been unsuccessful, and the extent of any deficiencies remain unknown. The Planned Parenthood facility continues to conduct surgical abortions. An initial licensing inspection took place at Prince George’s Reproductive Health Services on February 14, 2013. Six pages of violations were cited. •	There was no evidence that the facility maintained a required policy and procedure manual. The administrator told inspectors it was left at home. •	Abortionists had not been checked with the National Practitioners Data Bank to ensure they meet NPDB criteria. •	Employees were never required to demonstrate proficiency in patient care and infection control protocols. •	There was a lack of training in emergency patient transfer protocols. •	Drugs were improperly stored. •	No discharge diagnosis was recorded in patient medical records as required. •	Surgical instruments were not properly cleaned and sterilized. •	Cross-contamination was witnessed during the inadequate cleaning process. No follow-up inspection was conducted to ensure that the violations were actually corrected. Yet, the OHCQ issued the abortion business a Surgical Facility License. Inspectors from the Office of Health Care Quality did not return to the facility until October 15, 2015, when a relicensing inspection was done. It was then that the facility’s policy and procedure manual was finally produced to inspectors, only to discover that the clinic administrator did not implement critical policies. •	Lack of proper infection control practices. •	Failing to implement policies related to emergency disaster/fire drills. •	Failure to test and vaccinate employees for infectious diseases such as Hepatitis B and Tuberculosis. •	There was no suction machine for clearing patient airways in an emergency, as required. •	Narcotics and other drugs were missing or unaccounted for. A plan of correction was not submitted until January 12, 2016, nearly three months late. There is again no record that a follow-up inspection was conducted to ensure that the violations were ever corrected. Once again, the facility’s Surgical Abortion Facility license was renewed. •	Failure to provide emergency training for patient transfers to hospitals. •	Failure to implement infection control policies by neglecting to use steam indicators strips in each surgical pack to ensure proper sterilization. No follow-up inspection was conducted to ensure compliance, yet the OHCQ issued the clinic a Surgical Abortion Facility license. •	Failure to ensure that all staff are competent to do their jobs. •	Employees were not trained in emergency patient transfers (as cited previously in 2013). •	One of two abortionists did not have infection control training. •	Failure to ensure that staff practiced measures to prevent infection. •	Lack of hand washing. •	One staff member was observed cleaning toilet with her bare hands with a disinfectant wipe, then failed to wash her hands afterward. •	Abortionist failed to conduct a history and physical exam prior to a surgical procedure. He did not even bother to listen to the patient’s heart and lungs as a baseline in the event abnormal reading were later observed. •	No pre-op blood pressure readings. The abortionist was therefore unaware that one patient suffered elevated blood pressure prior to a surgical abortion procedure. •	Failure to conduct weekly spore testing of autoclaves to ensure they were properly sterilizing surgical equipment. Despite the worsening safety practices at this abortion facility, there was no follow-up inspection to ensure the violations had been corrected. The OHCQ renewed the facility’s Ambulatory Surgical Facility license. An inspection brought on by a complaint was conducted on April 7, 2016, but the facility was found to be in compliance. However, the pattern displayed by the Office of Health Care Quality during complaint inspections is to not look further than the specific allegations in the complaint. There is no evidence that previous areas where violations had occurred were ever checked for compliance. •	The facility maintained no procedures for patient safety that included fire and mechanical hazards. •	The abortionists were not checked with the National Practitioner Data Bank to ensure they were in compliance with NPDB criteria. •	Patient records were not secured to protect patient privacy. •	No steam indicator strips were used in surgical instrument packs to assure proper sterilization. •	Blinds in the procedure rooms were covered in a dusty substance. There is no evidence that a follow-up inspection was conducted to verify that the facility was actually in compliance with licensing requirements. Even so, the facility was issued a Surgical Facility License. 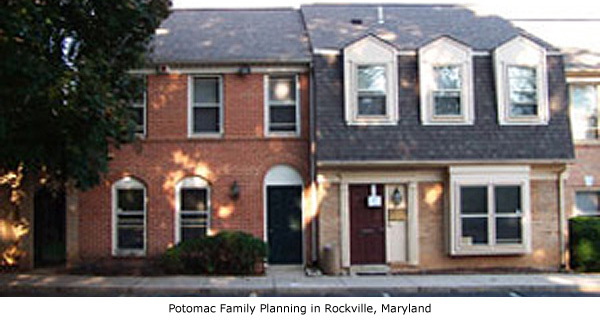 On July 21, 2015, a relicensing inspection was conducted at Potomac Family Planning Center where 17 pages of deficiencies were found. •	A laryngoscope (a light used for direct visualization of the throat for placement of a tube for breathing) did not work, which was just as well since it was contaminated with leaky battery residue. •	Disinfectant wipes were dried out, which diminished their effectiveness. •	Procedure rooms contained open containers containing used needles, which posed a hazard to patients. •	A surgical bed had multiple cracks and tears, making it impossible to disinfect. •	Cross-contamination was observed during instrument cleaning. •	There was also a failure to possess and maintain emergency equipment. •	There was no tracheostomy set, which could save a life in the event of an emergency. •	Failure of the abortionist to conduct required pre-op histories or physical examinations. •	The anesthesiologist failed to perform and document a patient risk assessment prior to administering anesthesia. He/she appeared unaware that such an assessment was required. •	Failed to conduct counts of controlled medication. Such counts had not been done since 2012. •	Expired medication and supplies were not discarded. •	There was no document of physician orders for the initiation of IV fluids and no policies and procedures for medication administration for 10 out of 10 medical records inspected. •	The facility failed to have a specific Malignant Hyperthermia cart set up even though a drug that causes this life-threatening condition was present. •	Open drug vials and other supplies were not dated. •	Evidence of stains or discoloration were found on “sterile” packages. •	A blank prescription pad was found in an unlocked drawer, making it vulnerable to unauthorized use or theft. A rare follow-up inspection was conducted on October 19, 2015, where it was found that the facility still did not monitor for expired medications and supplies. Nevertheless, the facility’s Surgical Abortion Facility license was renewed without any interruption of services. •	Failure to demonstrate proficiency or competency in administering and monitoring IVs. •	No fire prevention plans. •	Failed to check its only abortionist with the National Practitioners Data Bank to ensure compliance with the NPDB’s criteria. •	Employees were untrained in emergency patient transfers to hospitals. •	No preventative maintenance was conducted on the suction equipment. •	There were no policies and procedures regarding patient rights, as required. •	There were no policies and procedures to protect the privacy of patient records. As in every other case, after the initial inspection a Surgical Abortion Facility license was issued, even though there was no follow-up visit to ensure the violations were corrected. •	Failure to ensure that the staff was competent to do their jobs. •	Failure to review and revise the facility’s policy manual annually, as required. •	The abortionist’s performance pattern was not assessed biannually through the quality assurance program. •	Unlocked medicine cabinet was in the patient recovery room. •	Certain medications were not counted as required. •	Single dose vials of medication were used for more than one patient, against manufacturer’s warnings. •	Patient records lacked discharge diagnoses. •	Failure to conduct preventative maintenance on two ultrasound machines. •	A sharps container was filled with used needles to overflowing. •	Improper cleaning and sterilization of surgical instruments. •	Quality assurance was non-existent. This time, a follow-up inspection was conducted on October 23, 2015, and the facility was found to be in compliance. Its Surgical Abortion Facility License was renewed. •	Failure to secure medical waste sharps containers in the recovery room for the safety of patients. •	Failure to properly label drug syringes. No follow-up inspection took place to ensure compliance and the facility was issued a Surgical Abortion Facility license. A relicensing inspection was done on July 27, 2015, where is was found that 4 out of 10 staff members were not vaccinated or offered vaccinations for Hepatitis B as required by law. Whole Women’s Health’s Surgical Facility License was renewed even though no follow-up inspection was made to ensure compliance. Effects of the OHCQ’s carte blanche approval of Surgical Abortion Facility license applications despite failures of licensing inspections had immediate devastating effects. Back in 2013, during the first round of inspections, four abortion facilities operated by the notorious abortionist Steven Chase Brigham under the name Associates in OB/GYN Care were cited with a long list of egregious violations, including the death of an abortion patient, Maria Santiago, which occurred just six days prior to the inspection of Brigham’s Cheverly (Baltimore) abortion office. 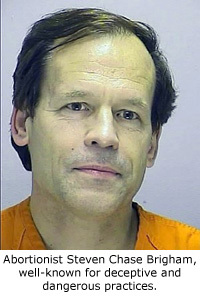 The abortionist involved in Santiago’s fatal abortion, Iris Dominy, was not certified in CPR at that time and failed to use a defibrillator on Santiago, who suffered cardiac arrest. Inspectors later discovered that the defibrillator did not work and staff had not been trained in its use. Dominy received only a reprimand for her negligence that resulted in Santiago’s death. Other violations cited were related to untrained staff, deficient infection control practices, improperly sterilized surgical implements, failure to maintain equipment, and expired drugs, to name a few. The OHCQ was well aware of Brigham’s shoddy and sometimes illegal business practices. In 2010, Brigham and his associate, Nicola Riley, seriously botched an abortion on a young woman. That incident led to the discovery that they were operating an illegal late-term abortion facility in Elkton that was part of a nefarious inter-state late-term abortion scheme that was meant to circumvent abortion limits in New Jersey where Brigham was based. Brigham and Riley were initially arrested and extradited to a Cecil County jail on charges of First Degree Murder after police searching the Elkton facility discovered the remains of 35 very late-term babies stored in a bloody freezer. Those charges were eventually dropped after a key expert witness for the prosecution pulled out of the case, but Riley’s Maryland medical license was revoked and Brigham, who was never licensed in Maryland, was ordered to stop practicing without a license. As a result, his New Jersey medical license was revoked. Despite this disturbing information, which should have prevented the licensing of Brigham’s four Maryland abortion facilities, the OHCQ issued Surgical Abortion Facility licenses anyway. Later, it was discovered that abortion drugs were being dispensed by unqualified workers. Women were placed in danger when the facilities made them orally ingest abortion drugs that were meant only to be injected. Three months after it issued facility licenses to the four facilities, the OHCQ suspended them all. It is clear that they never should have been licensed in the first place and that the process of licensing was inadequate to protect the public from dangerously non-complaint abortion facilities. While license suspension should have forced Brigham’s dangerous abortion businesses to permanently shut down, that has not been the case. Those clinics continue to operate as medication abortion clinics – dispensing the very drugs that resulted in their surgical abortion license suspensions. Because medication abortion clinics are not required to be licensed, these facilities are now not subject to the kinds of inspections that uncovered their shoddy and dangerous practices. A troubling pattern emerges throughout the pages of Maryland’s surgical abortion facility inspection reports. •	Time and again, the abortion facilities were found in non-compliance with licensing regulations. •	Repeatedly, correction plans were not submitted in a timely manner, without censure, sanction, or discipline. •	The Office of Health Care Quality repeatedly failed to follow up to ensure the facilities actually made the required corrections and were compliant with licensing requirements. •	The Office of Health Care Quality issued Surgical Abortion Facility licenses to clinics that it could not verify met the requirements for licensure. •	There have been no consequences to abortion facilities for non-compliance. There appears to be no motivation on the part of the Maryland Department of Health and Mental Hygiene’s Office of Health Care Quality to do anything but ensure that abortion facilities continue to supply uninterrupted abortion services, no matter how unsafe the facility. The OHCQ’s unwillingness to enforce licensing requirements in a meaningful way has essentially nullified the benefits of the 2013 regulations that required abortion facilities to meet minimum requirements for licensing. There is no doubt that dramatic reforms are needed within the Maryland Department of Health and Mental Hygiene’s Office of Health Care Quality. So far, the OHCQ has failed in its duty to ensure regulations are enforced and the public is protected from unsafe abortion facilities.